This week I was asked to interview someone from a different generation about their experiences with television as a child and the memories it gave them about the spaces they watched it in and with whom they watched it with. I immediately thought about my mother who had an interesting child hood moving from Florida to Australia, Japan, England and then back to Australia all by the age of 10. My mother, Rika, was born an ‘only child’ in Florida, USA in the 1960’s during the era of the American dream, and as we know the television was a huge symbol for this ideology. Colour television was available in America long before Australia and having a television was a presumed norm for any average American house hold. 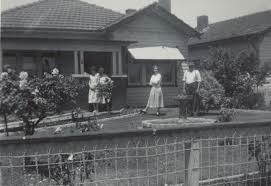 She lived in a 60’s Californian bungalow style house, it was open plan living, another lifestyle feature not yet introduced to Australian homes. Living close to Disney Land, cartoons such as the Mickey Mouse Club were extremely popular, as she grew older she remembers watching The Three Stooges on the couch with her father and the 6:00pm news broadcast every night, although she did not have siblings to fight with about what would be watched, her father was always in control of the viewing material. My mother being born in 1955 never experienced having black and white television until she moved to Australia at age 8 and even then her parents did not want to buy a television straight away. When Rika’s parents moved to Australia they had rejected the whole memory and notion of America, it became apparent to Rika that her parents no longer wanted to be associated or tied to the American Dream. This meant that they did not want to buy another television for several years after settling in their new home. However after several years of begging and pleading her parents to buy a tv, Rika went backwards in technology advancement and her family bought the only kind of television available in the late 60’s, a small, black and white boxy television with no remote and no vcr player. The test pattern was a familiar sight and all programs usually ended around 10:30 with a maximum of 2 or 3 channels. Upon reflection of my mothers memories I realised my personal memories of television as a child has a familial attachment to my dad making pancakes for my sister and I on a sunday morning and waking up at 6am to watch cartoons. Although it is safe to say that my mother and I have had very different experiences of television in the home, what with my experience of growing up with 3 televisions, 2 iPads, 2 laptops, 3 iPhones, Netflix and a Blue ray player which even now is becoming old technology, we still share a similar memory of watching cartoons with our fathers and them almost always having priority over the television….and the couch.